the way of identity or authenticity and no defense against surreptitious entry. Secure TRAC has been designed to meet the special needs of those responsible for the secure transportation of valuable merchandise. 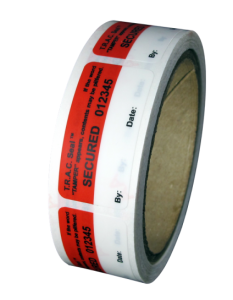 Secure TRAC can be applied as you would any normal carton seal tapes, either by automated mechanical dispensers or by hand tape guns and is available in any width from 1.5″s to 4″s and with solvent based adhesive suitable for high performance and durability. 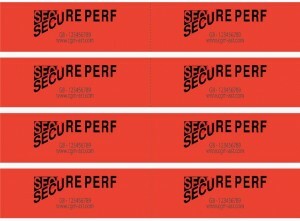 Secure TRAC is sequentially numbered every 9 lineal inches (25cm). Just the presence of our sequential number gives instant identity to the generic box or courier package. Due to its silicone face surface, Secure TRAC cannot be resealed if it is cut open making visual inspection easy as a glance! 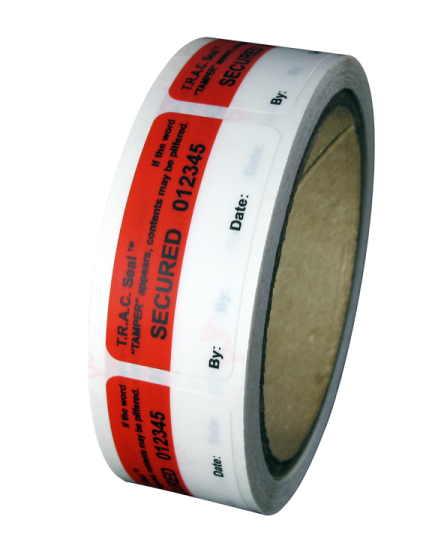 Regardless of the application Secure TRAC tamper evident tape, provides an excellent deterrent to theft while securely sealing your carton. If entry does occur you will know about it before a bill of lading is signed and title passes. It not only provides theft protection to generic courier boxes but it can be applied to stretch film or shrink film to enhance the security of the entire pallet during transit. Secure TRAC can be made in long rolls (2500 lineal feet on 3″ cores) suitable for automatic applications. When choosing a machine be certain that the nip rollers are silicone coated so as not to trigger the image before application! We can help you reconfigure the rollers, just call and ask. Don’t be fooled by tapes that can be circumvented or do not perform a security function. 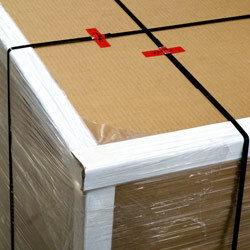 If your product is worth protecting against theft or tampering Secure TRAC is the right choice. Secure TRAC can be made indigenous to your company by using your logo or copy on the face and a custom language or copy as a hidden message. 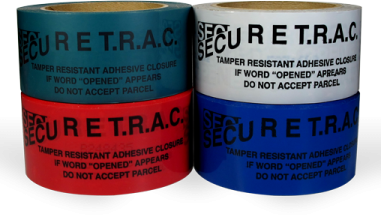 Secure TRAC comes in red, blue, brown, green, black, white and orange or custom colors. It is made from polyester or polystyrene, depending on the application. Adhesives and sizes are variable by application. Secure TRAC will afford you the luxury of a silent sentry on duty to protect your cargo while it is most vulnerable during transit. When security personnel cannot be present Secure TRAC provides all the protection you need to secure your assets. Upon delivery of your goods it provides recipients a simple visual template for inspection that can save your business from costly concealed losses. Available in 1″ x 2″ and 1″ x 4″ labels. T.R.A.C. 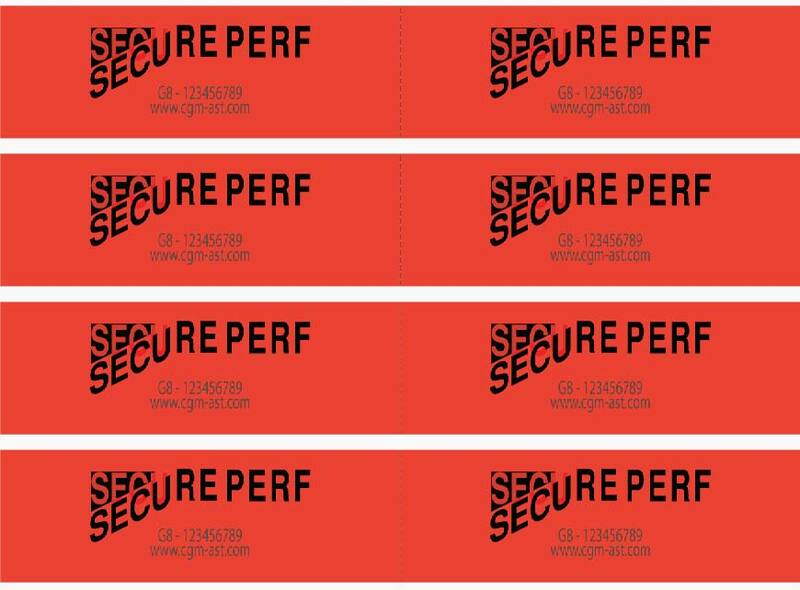 Seals are tamper evident security labels which will self destruct when removed, leaving the hidden message “TAMPERED” in both the film and adhesive residue on the surface. Red T.R.A.C. Seals are constructed of polystyrene film, which is also designed to tear when removed. Pricing is based on rolls of 1000 labels.